Forty years ago Will was a gangly 12-year-old running wild in the Mississippi delta. It was springtime in the Mississippi Delta, and the obligatory floodwaters had swollen the mighty Mississippi River well beyond its banks. The farmland on the river side of the levee is some of the richest on the planet. The turkey hunting is comparably bountiful. My dad and I were up in the predawn darkness. We parked the truck on the levee and launched our jonboat over the flooded main road running into the heart of our hunting club during drier months. The swirling maelstrom of floodwaters was fascinating to a 12-year-old caught up in the pitiless throes of puberty. Dad nailed a nice gobbler right off. The bird walked up on his side of the tree and dad’s 1960-vintage Browning Auto-5 12-gauge put meat on the table. My father’s inimitable facility as a turkey hunter kept Easter and Christmas stoked with the delectable creatures since the dawn of time. Now it was my turn. Like all normal young boys I tended to fidget. There were no drugs for such stuff back then and the approved treatment was exercise. As a result I was a rangy lad with nary a gram of excess body fat. it left the older disused levee dry above the flood. The old levee was built by slave labor in the early 19th century and served as foundation for the sundry primitive hunting camps housing sportsmen who so revered this remarkable piece of dirt. This antiquated structure had not been maintained in a century so it was breached in innumerable places by decades of relentless hydraulic action. Dad and I were arrayed with our backs to a large oak facing down a length of exposed levee. Some distance ahead the structure had been cut by the river and formed a deep bowl through which the Mississippi floodwaters now vigorously flowed. A homemade turkey blind my mom had crafted was arranged around us. I was doing my dead level best to be both still and quiet. The blind consisted of long dowels sharpened on one end and sewn into a large sheet of camouflage cloth. Dad pushed the pointed ends into the soft dirt so the bottom of the material stood a few inches above the surrounding forest floor. I was amusing myself studying the multitudinous insects crawling about beneath the edge of the blind when a turkey foot appeared unexpectedly in the little open space just adjacent my leg. CQB Turkey: After coming so close he could smell the acorns on its breath, Will shot the 18-lb. tom, still the largest he ever bagged! I looked up startled and found myself face to face with an equally discomfited tom turkey. Mere inches separated his beak from my nose. Had I been in full possession of my faculties I could have grabbed him with my hands. As it was, I was fortunate not to have screamed like a little girl. Those rascals are fairly unattractive up close. He undoubtedly thought the same of me. The terrified turkey rocketed off in a cloud of leaves as I fumbled for my Remington 11-48 20-gauge. This long-recoil-operated shotgun sported a twist-adjustable poly choke on the muzzle, a contrivance with which I fretted incessantly but in retrospect it likely made no practical difference. Regardless, I scrambled to my feet just as the turkey began to take flight. The big gobbler immediately dropped out of sight into the washed out section of levee before he gained altitude and rose back up into view, flapping furiously. I braced myself, drew a quick bead and dropped him on the wing with a single charge of 20-gauge Number 4’s. I was a good shot back then. My dad would accept nothing less. I ran up to the edge of the wash to find my turkey flopping in the water. I waded out into the muddy ooze with a stick and retrieved my prize. The bird was a nice 18+-lb. gobbler, the largest I ever killed. By lunch we had both birds cleaned, dressed and freezing. These two toms would take us through a full year of holiday dinners. Picking lead shot out of the main course was always a cherished part of our Christmas and Easter mastication. This happened four decades ago. I don’t really hunt any more but those magical times spent out in the woods with my dad made me the productive citizen I am today. The sights, sounds, and smells all conspired to imprint a visceral memory stirring my soul even as I sit typing these words. Our great republic is fraught with many ills but most could be simply rectified if more kids grew up as did I. On that fine spring day in the Mississippi Delta I got my first taste of true Close Quarters Battle — with a turkey. 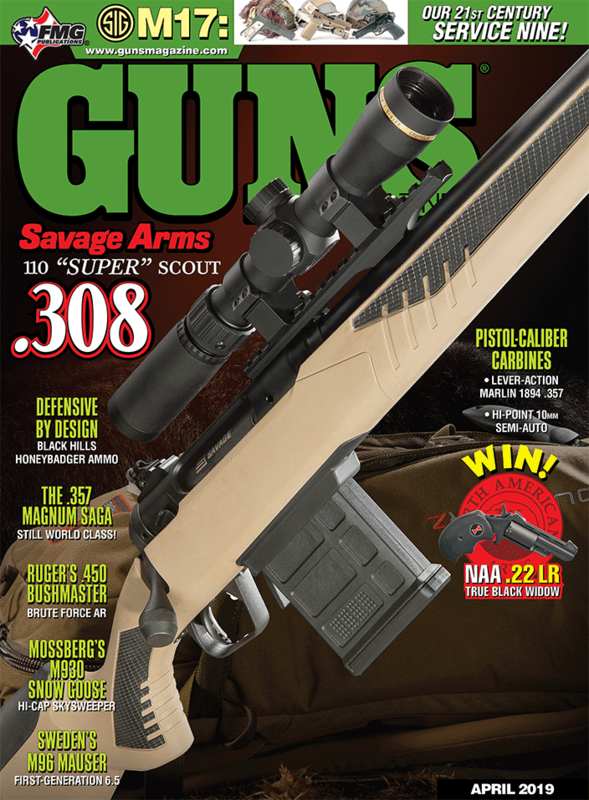 Purchase A PDF Download Of The GUNS Magazine April 2019 Issue Now!